The online version of this article ( https://doi.org/10.1186/s13020-019-0239-8) contains supplementary material, which is available to authorized users. Traditional Chinese medicine (TCM) is an ancient medical practice which has established a distinct diagnostic system. One key diagnostic methodology is to differentiate etiopathological patterns on the basis of clinical symptoms and signs collected through inspection, auscultation, olfaction, interrogation, and palpation of the pulses . According to TCM theory, depressive disorders can be classified into at least six different patterns [6, 7, 8]. Among them, liver qi stagnation (LQS) and heart and spleen deficiency (HSD) subtypes are the two most commonly occurring and opposing patterns, accounting for approximately 2/3 of depressed patients [6, 7, 8]. The diagnostic criteria for the two patterns have been well validated by several large-scale studies as shown in Table 1 [6, 7, 8]. The LQS subtype is often comorbid with nervousness and irritability; whereas the HSD subtype is characterized by excessive pensiveness, suspicion, and timorousness. One study has revealed considerable differences in the functional connectivity of the posterior cingulate cortex between “deficiency” and “excessive” patterns of MDD . 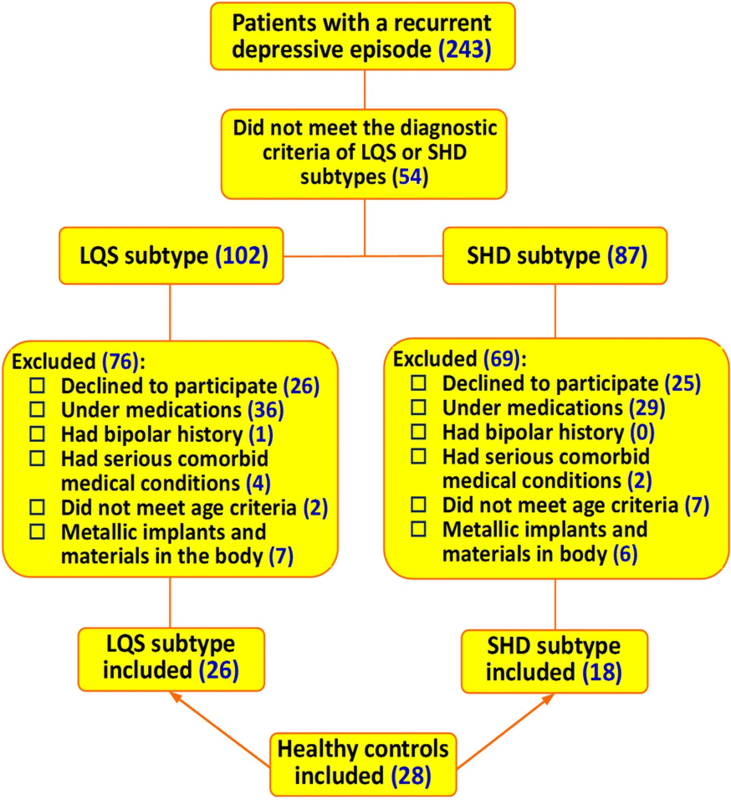 Most recently, we have revealed differential metabolomic profiles of the LQS and HSD subtypes of MDD . These findings have encouraged us to further explore brain connectomic correlates of TCM-based subtypes of MDD. Structural magnetic resonance imaging (MRI) studies have well demonstrated microstructural white matter abnormalities in distributed brain regions of depressed patients [11, 12, 13]. Significant differences in loss of white matter integrity also have been observed between atypical and melancholic subtypes of MDD  and between bipolar I and bipolar II disorder . These studies suggest that white matter network connectivity may be potential biomarkers for differentiating subtypes of MDD. We found that, compared to healthy controls and/or the HSD subtype, regional connectivity of the LQS subtype patients was increased in the angular gyrus, middle occipital gyrus, and Heschl’s gyrus, but decreased in the calcarine sulcus. The calcarine sulcus and occipital gyrus are directly involved in visual signal processing. Heschl’s gyrus, also known as the transverse temporal gyrus, processes incoming auditory signals. It therefore appears that the LQS subtype may represent aberrant connectivity of a temporal-occipital network involved in visual and auditory processing. Electrophysiological and fMRI studies have shown functional abnormalities in brain regions associated with visual attention, auditory processing, and cognitive control in depressed patients [22, 23, 24]. These findings could, at least in part, explain the fact that depressed individuals are characterized by biases in and ruminative responses to negative emotional materials , and the observation that visual and auditory hallucination often occurs in antidepressant treatment [26, 27, 28, 29, 30]. Clinically, the LQS subtype patients often exhibit stress-related comorbid symptoms and signs, such as nervousness, irritability, and pain disorders . These may result from hypersensitivity or hyperarousal of an aberrant visual and auditory perception-related temporal-occipital network when these individuals are exposed to negative emotional circumstance. Several limitations of this study should be considered. First, the sample size of this study was relatively small. Similar flaws also have been widely observed in previous MRI connectivity studies of MDD . In addition to insufficient statistical power to detect meaningful differences, small sample sizes may also result in heterogeneity across studies. Meta-analysis on a pool of connectomic studies of MDD and future large-scale research could yield more consistent and convincing results . Second, although TCM diagnostic patterns have been well established in clinical practice, the procedure is largely based on empirical evidence rather than structured interview and well-designed instruments. This could cause “subjective” bias and deviation. In addition, while there are at least six subtypes of MDD according to TCM classification, this study only examined the two most opposing, commonly occurring subtypes [6, 7, 8]. Whether other subtypes have differential connectome profiles remains for further investigation. Third, we used DTI-based connectivity analysis, rather than histogram analysis. Although histogram analysis is an effective tool to detect and quantify early tissue changes in different diseases, it only has limited ability in linking anatomical changes with functional deficits . In contrast, connectivity analysis is more powerful in drawing functional inferences from anatomical substrate . Finally, this study was observational in nature. We did not examine whether the therapeutic response to antidepressants or non-pharmacological therapy, e.g., deep brain stimulation (DBT), is different between the two subtypes. Whether there exist TCM subtype-related differences in the antidepressant response deserves for further investigation. Additional file 2: Table S1. 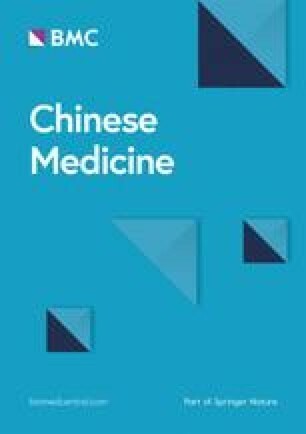 A statistical screening of connectomic variables between healthy subjects and traditional Chinese medicine diagnostic subtypes of major depressive disorders.